Head into the Rockies with wild mushroom enthusiast Michael Heim this Sunday (8/24) for a mushroom foray and a walk in the woods. You’ll gain a firm handle on the foundations of mushroom identification as you locate a variety of medicinal and edible fungi growing in the wild. You’ll have a chance to discuss mushroom anatomy and learn the tools for contrasting mushrooms that may be poisonous with those that may inspire a dinner party. You’ll return with a better understanding of what it means to hunt for mushrooms – and hopefully some fungi to take home. Please note, mother nature is a wild beast and we cannot guarantee the number or variety of the mushrooms we will find. Bring your positive attitude and your hiking apparel (i.e. long pants, hat, good footwear), as well as water/snacks and an awareness that we will be walking at elevation. All participants should come prepared for weather in the high country. Capacity is strictly limited and registration required. We will be meeting at the Nederland Visitor Center promptly at 9 am in order to figure out driving logistics and to have a brief discussion on what to expect for the day. Space filling fast! Register for the event here. Join us for the 5th Annual Tour de Coops, a fun filled tour of Boulder’s coops, gardens, hives and more. Whether you’re looking for inspiration or just looking for fun, this tour is sure to satisfy. Tickets and maps will be available at The Savvy Hen. Ticket Price: $3 per person, $5 for the whole family. Cash please. View newsletters from North American Permaculture Convergence here. This link will also allow you to subscribe to the list, and view other newsletters (click “Past Issues” on the top menu bar). A reminder to all that there is a Colorado Permaculture Guild van pool leaving from Erie to the North American Permaculture Convergence next week. Details here. If you cannot attend classes in the week prior, and plan to go for the weekend, feel free to email me and I can help to put you in touch with others in the area who are driving out. Deb and her husband are graduates of the 2013 Advanced PDC with Becky Elder, Sandy Cruz and Peter Bane. Hope this finds you all well. 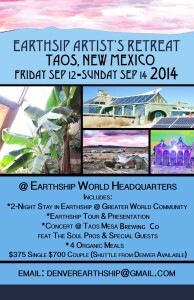 We are doing an Earthship Artist’s Retreat, presentation and Tour to Taos, New Mexico on Sept. 12-14 2014. Check out the flyer and if you are ready to go email and/or paypal denverearthship[at]gmail[dot]com to reserve your space. They will go fast! $375 for singles…$700 for couples. 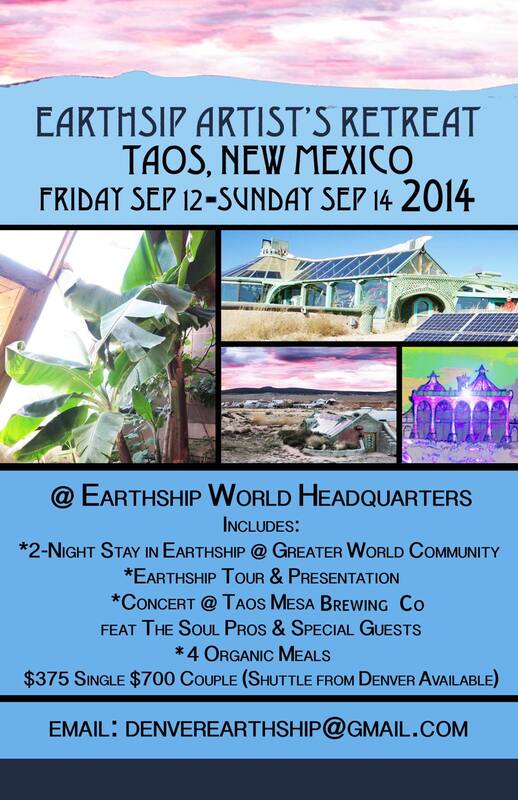 Shuttle is available from Denver to Taos and Back. Have you been thinking about keeping your own flock of chickens? Intro to Backyard Chicken Keeping will teach you how easy it is to keep your own flock of chickens-they are easier than dogs! Backyard chickens are both desirable and attainable. Chickens produce eggs, are nature’s rototillers and pest controllers, are wonderful pets, and provide an earth connection for their owners. The workshop will cover all of the basics of caring for baby chicks and adult chickens in both urban or suburban settings. The basics include: why raise chickens, how to buy chicks, tips for trouble-shooting potential diseases and predators and how to manage the brooder, heat, water, feed, litter, roosting, space and various coop possibilities. Chicken laws are changing in Colorado and most municipalities allow you to keep 5-8 backyard birds. Jump on the wagon! Born and raised in Wisconsin, Instructor Tara Rae currently garden-farms on the Front Range of Colorado. Tara Rae holds an Advanced Permaculture Design Certificate and Permaculture Teacher’s Certificate. An avid composter, she has been vermi-composting for over a decade, starting dozens of folks with worm farms every year. She teaches at her home as well as around the state of Colorado offering various Permaculture and urban farming classes at schools and festivals. She has managed several greenhouses, USDA-organic, non-certified organic, and permaculture farms with experience in 3 climate zones – cool and wet; cool and dry; and warm and wet. Over the last 15 years, Tara Rae has worked in scientific laboratories for universities, taught water quality monitoring classes, and authored a nature center field guidebook. She holds a Master’s Degree in Freshwater Ecology, and works as an environmental scientist/ecologist for HDR EOC. Her passion for sustainable living has led her to volunteer for the Sustain Arvada Advisory Board to City Council, making recommendations for sustainable community development and vitality. No experience necessary. This is a Parent and Child Approved workshop, meaning that your child (ages 6-13) may attend with you for a reduced price. Seniors (55+) receive a 20% discount off of their registration fee. Minimum of 4 participants, maximum of 15. Pre-registration is required. Herbalism is the use of plants for medicinal purposes, and this workshop is the perfect introduction to discovering the hidden medicinal qualities in every day, and not so every day plants. This workshop is the first in our Herbal Medicine Making series, and will focus on Women’s Health. Learn to use food, herbs, essential oils and other natural remedies for menstrual health, fertility, menopause, yeast overgrowth and libido. Save money and heal yourself naturally! Participants will get to sample the herbal concoctions made in this workshop, and will leave with an information packet to aid in their journey as herbalists. Instructor Brigitte Mars is a medical herbalist and nutritional consultant who has been working with Natural Medicine for over forty years. She has taught Herbal Medicine at Naropa University, Omega Institute, Esalen, Kripalu, The Mayo Clinic, Bauman College of Holistic Nutrition, The School of Natural Medicine and Just for Health. She blogs for the Huffington Post and Care2. She is also a professional member of the American Herbalist Guild. Brigitte is the author of many books and DVDs, including The Country Almanac of Home Remedies, The Desktop Guide to Herbal Medicine, Beauty by Nature, Addiction Free Naturally, The Sexual Herbal, Healing Herbal Teas, and Rawsome!. Her latest project is a phone app called IPlant. No experience necessary. All materials and supplies provided. For participants ages 12 and older, minimum of 4 participants, maximum of 12. Pre-registration is required. Join us for a look at the fascinating world of mushroom identification in this “walk in the woods” style workshop. This is your chance to gain a firm handle on the foundations of mushroom identification, as we will locate a variety of medicinal and edible fungi growing in the wild. We will discuss mushroom anatomy and learn the tools for contrasting mushrooms that may be poisonous with those that may inspire a dinner party. Lots of fun facts and information will help participants learn about how mushrooms grow and interact with the natural world. Please Note: We are dealing with nature, and cannot guarantee the number or variety of the mushrooms we will find. Please bring your positive attitude and come prepared for anything! We are going hiking in the woods and trying to unlock the mystery of nature, so you will receive an education on this topic, no matter what. All participants should come prepared for weather in the high country–and note that hiking apparel is a wise idea(ie: long pants, hats, good footwear, water bottle, snack). Though we are hiking in the woods, we will not be moving at a rigorous pace, so hikers of all skill levels are welcome. This is an identification workshop, not a foraging workshop. For those who are curious, we will briefly discuss the legalities of foraging for mushrooms in Colorado. Instructor Michael Heim’s interest in plants began while attending college, when he took a Horticulture class to satisfy a “hard science” requirement. Around the same time he learned how to forage for wild mushrooms. The passion was “planted”! Since then he has been fusing his passion for spirits and culinary creations with his passion for botany, mycology, and wild foods. When he’s not out foraging, he can be found practicing his creative (and botanical) mixology at The Kitchen in Boulder. No experience necessary. This is a Parent and Child Approved workshop, meaning that your child (ages 8-13) may attend with you for a reduced price. Seniors (55+) receive a discount off of their registration fee. Minimum of 4 participants, maximum of 18. Pre-registration is required. *We will be meeting at the Nederland Visitor’s Center and carpooling to our final destination from there*. See The Living Arts School’s website for their workshops on fermentation!